The Argus blends minimalist design with technical intelligence in a piece that combines breathability, insulation, weather protection and ergonomic freedom. Lightweight, hydrophobic Octa® Loft synthetic insulation in the front and shoulders adds warmth with minimal bulk. Lumin™ 100% nylon face fabric sheds wind and light precipitation, and the breathable, moisture wicking Torrent™ back panel give ventilation and freedom of movement. Features are pared to the essential, each selected to enhance performance during runs, cross country skis, snowshoe races and other cold weather, high output activities. Two easily accessible rear stash pockets hold gloves, hat or energy foods. An adjustable drawcord at the hem seals out cold, low profile thumbholes hold sleeves in place, and reflective blades on the back and sleeves improve visibility in low light conditions. Redesign utilizes Octa® Loft breathable insulation, zippered hand pockets and updated fabric in the lower back panel. * Lumin™—100% nylon 6,6, 49 g/m². Very strong for its weight, this lightweight 20D ripstop taffeta features nylon 6,6 yarns. Lightly breathable with a DWR finish. Argus Jacket - Mens is rated 4.3 out of 5 by 8. Rated 4 out of 5 by DNRb4DNF from Great running piece. I own quite a few running jackets but the Argus is by far my favorite for cold winter running. It fits close and weighs almost nothing but it keeps me warm when temperatures are below 30 degrees F. I've worn it in single digit temps. with just a long sleeve base under it and stayed completely warm. Above 30 and I switch to the Trino. I do agree with the earlier reviewer about fabric durability. After wearing this jacket this past winter with a hydration vest I now have a hole worn in a friction spot on the back. Hence the 4 and not 5 stars. This piece does what it claims and I will get another if the back material is strengthened. Rated 5 out of 5 by RayOttawa from Perfect jacket for winter running I signed up for a May marathon which meant lots of training in February and March in chilly Ottawa. This jacket delivers suprising warmth and excellent wind protection without being bulky in any way. Back pockets very handy for extra gloves, hat, or headband. I could fit into a small, but opted for a medium to allow for additional layers when necessary. With the right layering under my argus jacket I had no trouble doing 10+k runs even in -30 degree conditions. Jacket dumps heat well. My only challenge at these temperatures was my ipod battery freezing in the front pocket - easily rectified by moving the ipod into a base layer pocket. I fully recommend the argus jacket to anyone contemplating cold weather running. Rated 5 out of 5 by bmosso from Just one worrd: Superb... I´ve tried several jackets before from ASICs, Nike, not one comes close to the clever design, superior materials used in the Argus Jacket. Not only is this garment well designed , each fabric is positioned so that you get the best out of your sport, no overheating while running, protection/isulation where is needed. The DWR fabric makes it perfect for some light rain, its a great jacket to go out running here in Germany. I have used it also as mid layer while hiking in the Alps.. it works just as well. Rated 3 out of 5 by yorgos from My go to midlayer for almost every activity outdoors I really love my Argus jacket. I initially bought it as a running jacket but it is impossible to use it as one because it is just too warm to wear it while running. So it quickly became my warm up jacket plus I found that it serves amazingly as a midlayer when alpine climbing and I doubt I have worn another midlayer since I bought this one when I m on the mountains. The problems and the reasons I dropped my rating are that with the first fall on ice and after stopping myself i found that the Torrent fabric had a few holes on it so the durability is just not good enough and the other reason is that it's just not suited for the purpose I bought it although I found another use for it and still love it. In conclusion my big disappointment was the durability of the fabric and the fact that I have to patch my favorite midlayer after my first fall. Rated 5 out of 5 by mikhail from Works great for running and skiing Getting our to run once tempretures drop beflow 20F is difficult for me. I wanted a jacket that is warm and comfortable that I can wear our for a run no matter how cold it is. This jacket is very well designed for running. Shoulders and front are light and well insluated, back, armpits and areas underneath forearms are very well ventilated. Forearms area has been very problematic for me because most of the warm running jackets do not ventilate well in that area and I end up with puddles in my forearm area. With this jacket, this problem is gone. 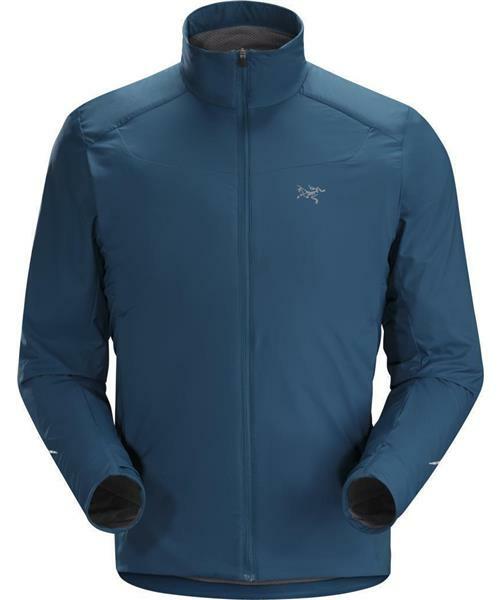 Arcteryx is not a runnign company and I've look at running jackets from Nike, Gore, Saucony, New Balance, etc. This is the best running jacket for tempretures below 25-20F degrees. I also took this jacket on a recent xc skiing trip in Lake Placid. It worked just as great as it does for running. Very well organized, all the right fabrics in the right places. I would make two improvements to this jacket. Better zipper quality and maybe slighly 1/4" taller collar. Rated 5 out of 5 by Kyle from Very warm and breathable. Suitable for many activities Ran with a Long sleeve Mock Neck in -8 Deg C, the jacket did an excellent job in keeping me warm while being breathable. It still keeps me warm when I was walking back home for about 15 minutes. The Polartec Alpha is really an excellent insulation! Rated 4 out of 5 by NearlyDutchDan from Lovely balance A brilliant balance between warmth and breath-ability. I need highly breathable layers and this fits the bill. I will use this for pretty much everything.